Hurdlers must be able to combine the speed of a sprinter with the technical demanding technique of a hurdler. They must be powerful and strong, have the correct physique-tall or have proportionally long legs-so hurdles can be cleared with ease. The technique for hurdling requires the athlete to be able to flow over the obstacles at speed without seemingly breaking stride. Hurdling is a combination of a running race and a field event, and here more than in any other event technique and style rule. A hurdler with good technique will beat a faster sprinter with poor style more often than not. The stride pattern for a hurdler is 7-8 strides to the first barrier and 3 strides between each hurdle. Because the first hurdle is so close a hurdler must be upright quicker than a sprinter, usually after 3-4 strides. Block spacings have to be altered to achieve this and the take-off foot is always placed on the front block when using an 8 stride technique. Novice hurdlers and youngsters often train without any hurdles present. Cones or other objects are positioned where the hurdles will be and the athlete concentrates on getting over the objects using the proper technique. This stops any injuries occurring when the novice hurdler gets the stride pattern wrong and also gives younger athletes more confidence, which lets them concentrate on their stride pattern. When clearing a hurdle the athlete has to aim to clear the hurdle by approximately 17-18cm, as quickly and efficiently as possible. Their centre of gravity should be raised only slightly higher than when sprinting normally. 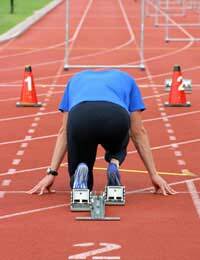 The final stride to the first hurdle is shortened to allow the take-off leg to travel quickly under the hips. This allows a fast powerful drive can be made across the hurdle. The knee has to be picked up rapidly and driven at the hurdle. The lower part of the leg remains low and is picked up once the knee reached the height of the hurdle. The knee must be kept vertical to the body and shouldn't be pulled across the body. When the heel of the lead leg passes over the barrier it must be brought down and back to be placed under the body. The lead leg should be straightened as it comes down toward the ground. The trailing leg should drive the body towards the hurdle as the lead leg rises. The athlete should be aware of the trailing leg sweeping wide and flat over the barrier, with the ankle turned to avoid hitting the hurdle.The knee should continue rising and come round in front of the body when the barrier is cleared. The ground between hurdles is covered in three strides and to achieve this athlete's shave to modify their sprinting technique. A fast leg cadence and a shorter stride length are required. The athlete may have to use a lower knee lift than in normal sprinting with an emphasis on leg speed. Hurdling is dangerous on a slippery or wet surface especially wet grass, and beginners shouldn't train with hurdles in these conditions. It's also important that young athletes shouldn't try and clear the barrier from the wrong direction (with the feet of the hurdle on the near side) as the barrier won't give way as it should if hit.